Please ignore the mess of bricks and leftover lumber lying on the floor at the bottom of this picture. Instead focus on the cabinets! Family friends were cleaning out their basement and passed on quite a few pieces of lumber and odds and ends they thought could be reused. The cabinets came along for the ride too. With a little sanding and a paint job (when I get to it!) they will blend in perfectly. In total they gave me three cabinets. Two are in the picture above and one more has yet to be hung. The two cabinets in the picture were actually several inches taller and needed to be cut to fit the space beneath the windows. After that I cut 4 pieces of 1"x4" and attached them to the back of the cabinets so that I could hang the cabinets to the wall. The white piece of lumber on top isn't for the top of the cabinets but was attached to one of them and had to be removed before I could cut the cabinet to fit. In between the two cabinets I left a small space of about 11-12". Soon I'll hook in some brackets for a few shelves for the in between space and it will look like one large cabinet. The other cabinet will fit above the window but won't run the whole length of the space, although I might be able to add a couple shelves to utilize all the space! That certainly sounds like a great plan you have. I make sure to include nice looking cabinets for my shed and it looks great. 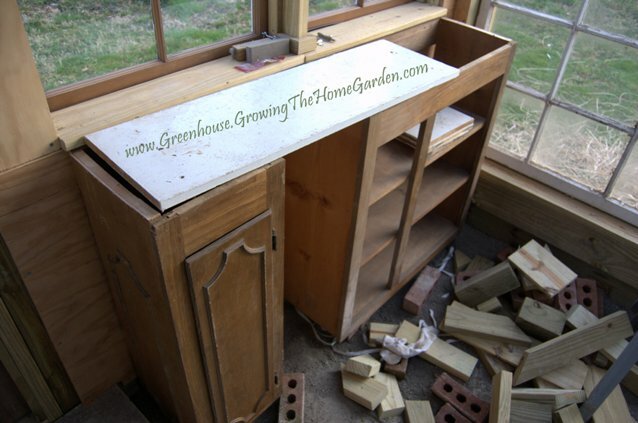 Well, it's good that you have more cabinets in your garden shed so you can organize your gardening tools and other stuff that your store in your shed. I think your plan on where to put those cabinets is ok.